Whoever is scheduling the races is obviously not impressed with the North American tradition of placing the stakes race near the end of the card. On Sunday, the Yaddo Handicap was run as the fourth race and the West Point Handicap as the seventh. There were 11 races in all. On Monday, the $80,000 Troy Stakes for 4-year-olds and upward went off as the fourth. Originally scheduled for the Mellon Turf Course, the 5 1/2 furlong sprint was moved to the dirt course. The sealed main track, listed as muddy, looked like a rice paddy. Miraculously, the rain subsided before the first call to the post. The improvement didn’t portend sunshine, or a big crowd. But it made the experience less painful for the 14,158 people who braved the cold. With a high temperature of 63 degrees, being at the track seemed like being in a meat locker. Two hours later, the rains came again. It’s a shame things shaped up this way because the Troy went off under cloudy skies with only five starters. Trainer Kiaran McLaughlin has been waiting since January to learn how good Hellvelyn, Sheikh Rashid’s Group II winner in the UK, might be. Now trainer and sheik have to wait a little longer. McLaughlin scratched the British-born grandson of Danzig. Ferocious Fires, a giant-sized gelding coming off the “main track only” list, beat the small field by a length and a quarter, posting his eighth win in eight starts on dirt – a perfect four for four at the Spa. 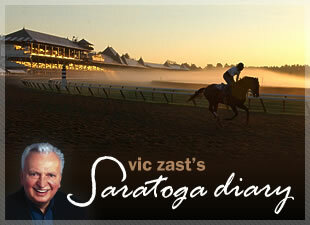 It was Tony Dutrow’s sixth Saratoga win from 16 starters. Later, with the track listed sloppy, Vegas Wedding seized the nightcap. Elvis Trujillo was to be here to ride the number 10, No Speed Limit, and then the result would have been different. Trujillo and trainer Wesley Ward have won with four of the eight starters they’ve tamed up on. When Trujillo realized the jockey’s softball game against the policemen was going to be called off for Monday night, he, like the front running No Speed Limit in the 10th race, must have bagged it. Off the track, something of note occurred earlier. “Little Louie” Olah, the silks man for New York tracks for 40 years who passed away in March, was posthumously honored. From now on, it’ll be the Louis Olah Silks Room at Saratoga. On Wednesday, the first day of the second half of the meet, the weather is supposed to get better. Bold Union, a winner of her two lifetime starts by a combined 20 1/2 lengths, is favored in the $150,000 Adirondack Stakes (gr. II). If the filly wins, she’ll be the ninth of 10 horses to win that day.